Commentary: The 2018 release of The Vintage Collection got us a lot of reissues alongside new figures, to date focusing primarily on the newer movies. 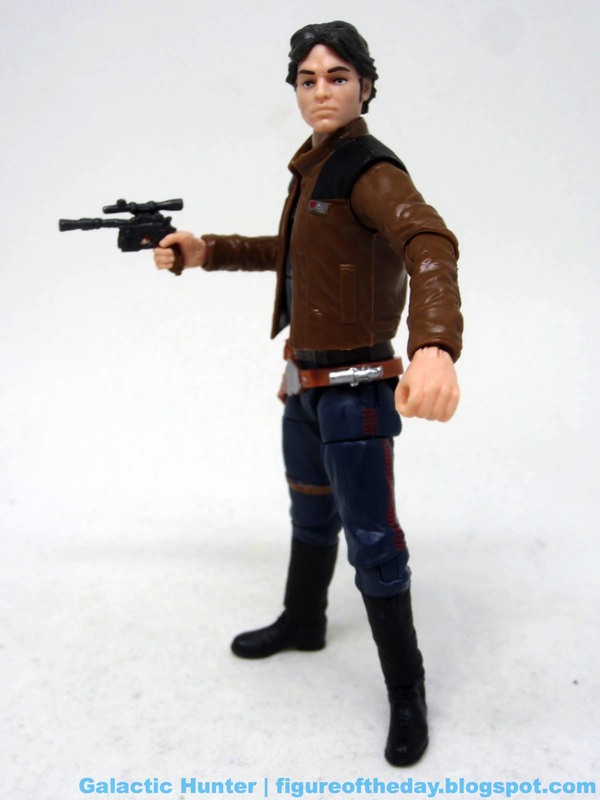 One of the all-new figures is this Han Solo, a marked overall improvement over the Force Link 2.0 pack-in which, it would appear, I did not yet review. Well then. Packaged collectors and diorama fanatics should get the Vintage one. Those looking for a figure that sits, get the 5-jointed Force Link 2.0 pack-in when it hits clearance. I am comfortable saying that about Force Link 2.0. It's a magical idea with a lot of quirks baked in to it. 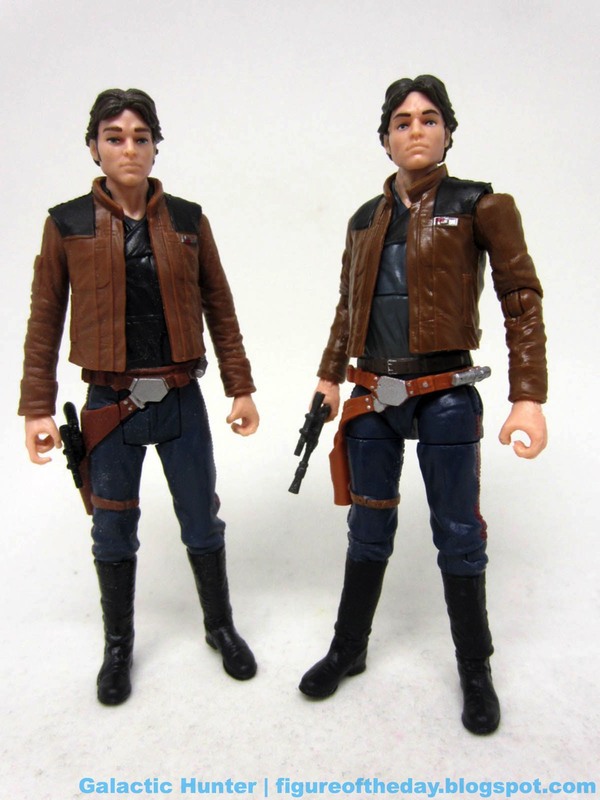 The figure sculpt is similar in both figures, with deco that's nearly identical. The Vintage figure has dark grey in the shirt, while Force Link 2.0 is all black. Vintage has some painted silver rivets, while Force Link 2.0 only has 2 on the front and the back of the belt is completely undecorated. The differences are minor enough that I would not call them overwhelmingly significant. In terms of articulation, Vintage Han gets the full treatment with 28 total joints on his 3 3/4-inch person. Getting the legs to swing forward with the separate rubbery belt is a little tricky, as the hips have a bigger range of motion but require more fidgeting on your part. It's not as simple as the swing-forward classic design of the late 1970s. The red striped pants are here, the two-toned jacket looks nice, and the elbows have better-than-usual bending on them. The bend-and-swivel wrists can grip a brown-painted blaster grip, giving you a pretty decent experience as a collector. This is, arguably, the superior figure. The likeness isn't quite there, but I still believe the figure was made without that as a consideration. 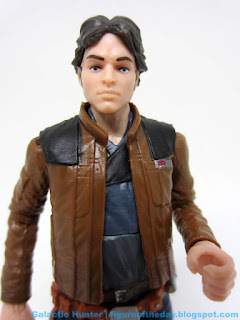 It's a good Han Solo, and it's not really Alden Ehrenreich. I guess we can say the same about a lot of human figures. I like it packaged a bunch, but it might not be your cup of tea. I liked the movie for what it was, so I'm glad to have it - and I hope you snag one if you see and want one. You won't be disappointed, but you won't be impressed either. Vintage figures rarely exceed their mandate.